Powys Council has barred one of its councillors from debating and voting on planning applications relating to wind farms. Bob Mills, who represents a Newtown ward, is believed to be the first Powys councillor to be banned in such a way. Council chiefs said Mr Mills had prejudiced his position by making his opinions about wind turbines public at a meeting and in a newspaper. But he claimed he had been "gagged" by the council for having an opinion. The council said it had strict guidelines about impartiality when it came to planning issues. In a letter to the Mr Mills, who sits on the authority's planning committee, the council's monitoring officer Jeremy Patterson reminded the councillor of them. 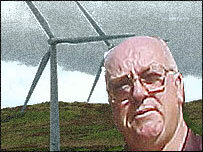 Mr Patterson said Mr Mills had formed a "clear and settled view" in relation to wind energy. He added: "I am aware that you had a letter published in the County Times on 30 December which on my reading clearly indicates that you have formed a very clear and unequivocal view on the issue of wind power." 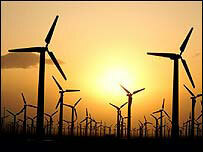 He said Mr Mills had also expressed "very strong views" about wind energy at a council meeting on 26 January. As a result, Mr Patterson said Mr Mills would have to leave the council's debating chamber during discussions and voting on future wind energy applications. Mr Mills, an independent councillor for Newtown south ward, said he was "very, very annoyed" by the decision. "I am being gagged for having an opinion about wind farms," he said. "It's very difficult not to have an opinion about something that is so emotive in Wales." Conservative AM Glyn Davies sympathised with Mr Mills. He said: "If anyone who publicly expresses either their support for or opposition to wind farms is going to be banned from the decision making process, the concept of free speech is dead. "I have already accepted that because I have been elected chair of the national assembly's environment, planning and countryside committee that I am unable to publicly express my opinion on wind farms." There are around 400 wind turbines in Wales, many of them in central areas of the country.